The “Trigger Seq” for iOs / iPad is actually available for free (until 1st December). 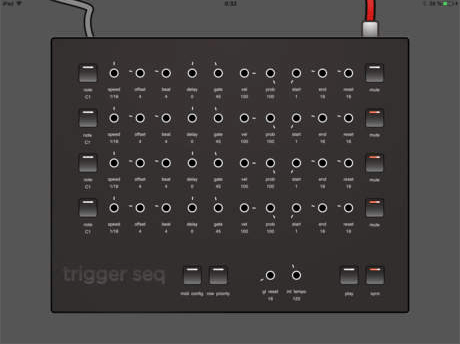 It is a trigger based sequencer for MIDI instruments in a pure analog style. – 4 rows with individual clock division, velocity, gate, note selection and mute on/off. – Allows to sequence any device that understands MIDI. – Internal (60-200 BPM)/external clock. The perfect tool to create groovy sequences on the fly! it remind us of the discontinued Doepfer Schaltwerk hardware MIDI sequencer. And since it’s actually free, give it a try !